I think my love of wall stickies is probably rooted in my childhood love of stickers, but, really, I think that it's the way that they easily transform an otherwise boring room that makes me a fan. I love the idea of completely changing a wall without the use of paint or stencils. These playful stickers by Hu2 Design would work perectly in a kitchen or dinning area. I espeically like the one titled Essential Dessert Recipes. 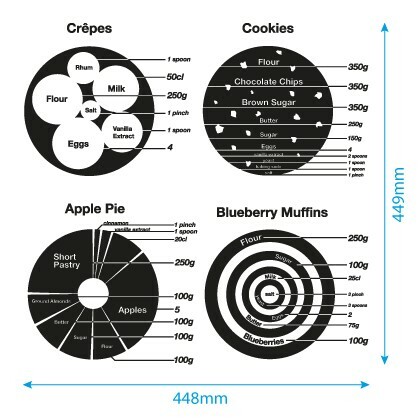 It's a design element and a cookbook all in one! Click here to shop the Hu2 sticker collection online. 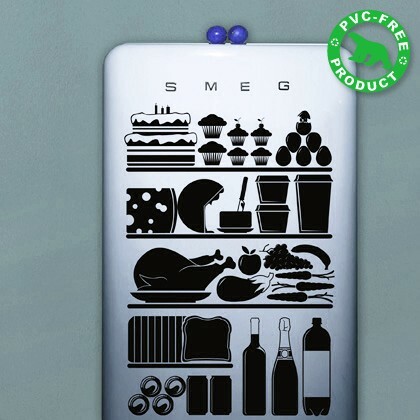 These are fabulous - I've always thought I wanted penguin decals on my fridge, but the food silhouettes are wonderful - I'd just spend all my time wishfully hoping to find such goodies inside, though! Those are fantastic. Wall stickers seem to be all over the place these days, I even saw them at Target. I love the refrigerator sticker!!! 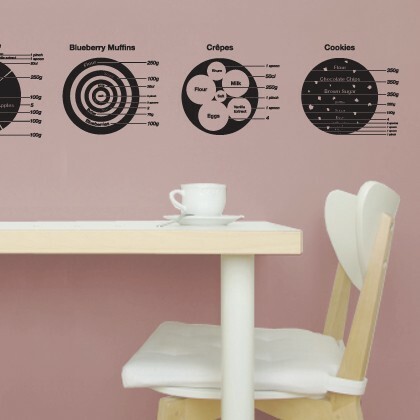 These Kitchen Wall Decals stickers are really nice.